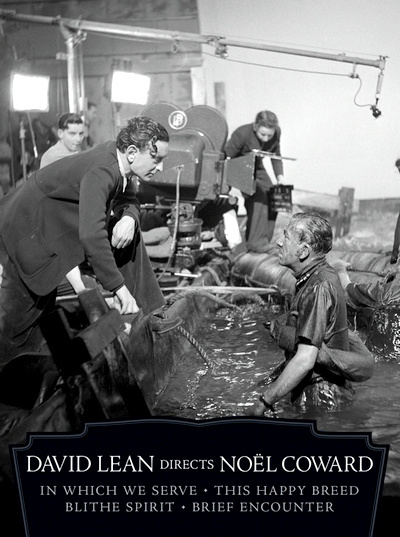 Few filmmakers in the history of cinema can rival the artistry and vision of David Lean, and few dramatists in the history of comedy can claim more cutting quips per capita than Noel Coward. Yet when the two teamed up in the early 1940s for a quartet of pictures, 'Lawrence of Arabia' was still two decades away, and the young Lean, a well-regarded editor, had yet to direct his first feature film. Coward, long established as a popular playwright and icon of sophistication and wit, gave Lean that opportunity, sharing the directorial reins with him on a rousing British wartime propaganda film, 'In Which We Serve.' The movie launched Lean's distinguished career and spawned a fruitful - albeit brief - partnership with Coward that allowed the fledgling director to hone his skills and develop his distinctive style. The Criterion collection has brought together his first four films, and they were all adaptations of Noel Coward’s work. The included films - 'In Which We Serve' (1942), 'This Happy Breed' (1944), 'Blithe Spirit' (1945), and 'Brief Encounter' (1945) - run the gamut of genre and emotion, encompassing war, devotion, family, romance, comedy, and tragedy. Yet the common thread they share is a vital sense of humanity, thanks to vivid, dimensional characters who express universal feelings in a literate, forthright manner. These may not be the most well-known titles in Lean's astoundingly rich film canon, but they are undeniable classics, and it's an inspired move by Criterion to package them all together, so movie buffs can analyze and cherish their artistry and impact. They also paint a portrait of Britain's stiff upper lip society during the stressful World War II years when English citizens showed true grit, Herculean stamina, and enviable courage, while maintaining their sense of humor and well-being. As a snapshot of a finite time period and a culture in crisis, these four films remain unrivaled in their cohesiveness, painting a portrait of Great Britain from the inside out, and their historical significance cannot be underestimated or undervalued. A British Naval ship, HMS Torrin, is attacked and destroyed by German bombers during the Battle of Crete. The captain, 'D' Kinross (Noel Coward), and a few of his men survive the attack and gather around a life raft floating freely well off the coast. As the bombers routinely come back and strafe the area, the men begin remembering the best days of their lives. Completed two years after In Which We Serve, This Happy Breed is set between the end of the First World War and the beginning of the Second, and tells the story of a working-class family, the Gibbonses, from London. Successful writer Charles Condomine (Rex Harrison) asks the extravagant medium Madame Arcati (Margaret Rutherford) to conduct a seance in his home. He hopes to include the experience in his next novel. Things go decidedly not as planned when she summons the spirit of his dead first wife (Kay Hammond), a severe inconvenience for his current one (Constance Cummings). Laura Jesson (Celia Johnson) encounters Dr. Alec Harvey (Trevor Howard) at a busy railway station. She is immediately drawn to him; he could hardly take his eyes off of her. The two begin to meet regularly. Eventually, they realize that because of their families and status there isn't any future for what they have initiated. But instead of parting ways, the two decide to simply follow their hearts. • Barry Day - in this video interview, Noel Coward expert Barry Day, author of Coward on Film: The Cinema of Noel Coward, discusses In Which We Serve. The interview was recorded exclusively for Criterion in October 2011. In English, not subtitled. (17 min, 1080p). • A Profile of "In Which We Serve" - a short documentary on the making of In Which We Serve produced in London in 2000 for Carlton International Media. The documentary features interviews with cinematographer Ronald Neame, actor John Mills, associate producer Anthony Havelock-Allan, Noel Coward biographer Sheridan Morley, third assistant director Norman Spencer, and actress Lucy Fleming (Celia Johnson's daughter), among others. In English, not subtitled. (25 min, 1080i). • Coward and Attenborough at the NFT - an audio recording of a discussion between actor and director Richard Attenborough and playwright Noel Coward, which took place at London's National Film Theatre on December 14th, 1969. In English, not subtitled. (66 min, 1080p). • Trailer - original trailer for In Which We Serve. In English, not subtitled. (2 min, 1080p). • Barry Day - in this video interview, Noel Coward expert Barry Day, author of Coward on Film: The Cinema of Noel Coward, discusses This Happy Breed. The interview was recorded exclusively for Criterion in October 2011. In English, not subtitled. (15 min, 1080p). • The Golden Age - director, cinematographer, producer, and writer Ronald Neame, who was one of three partners in Cineguild Productions, together with David Lean and producer Anthony Havelock-Allan, discusses the shooting of In Whicn We Serve, various Cineguild Productions film projects, Noel Coward, etc. In English, not subtitled. (45 min, 1080p). • Trailer - original trailer for This Happy Breed. In English, not subtitled. (3 min, 1080p). • Rerelease Trailer - the rerelease trailer for This Happy Breed. In English, not subtitled. (3 min, 1080p). • Barry Day - in this video interview, Noel Coward expert Barry Day, author of Coward on Film: The Cinema of Noel Coward, discusses Blithe Spirit. The interview was recorded exclusively for Criterion in October 2011. In English, not subtitled. (12 min, 1080p). • The Southbank Show: "Noel Coward" - this 1992 episode of The Southbank Show, hosted by Melvin Bragg, covers Noel Coward's life and career in theater, film, and music. It features archival footage and interviews with actors John Gielgud, Daniel Massey, and John Mills, biographer Philip Hoare, and playwright John Osborne, among others. In English, not subtitled. (51 min, 1080i). • Trailer - original trailer for Blithe Spirit. In English, not subtitled. (3 min, 1080p). • Commentary - this is the same audio commentary by film historian Bruce Eder, recorded in 1995, which appeared on Criterion's 2000 DVD release of Brief Encounter. • Barry Day - in this video interview, Noel Coward expert Barry Day, author of Coward on Film: The Cinema of Noel Coward, discusses Brief Encounter. The interview was recorded exclusively for Criterion in October 2011. In English, not subtitled. (17 min, 1080p). • A Profile of "Brief Encounter" - a short documentary on the making of Brief Encounter produced in London in 2000 for Carlton International Media. The documentary features interviews with director, cinematographer, producer, and writer Ronald Neame, producer Anthony Havelock-Allan, actresses Margaret Barton and Lucy Fleming (Celia Johnson's daughter), and actor John Sessions, among others. In English, not subtitled. (25 min, 1080i). • David Lean: A Self Portrait (1971) - a wonderful documentary film, directed by Thomas Craven, featuring an extensive interview with David Lean, who discusses his career and work. In English, not subtitled. (59 min, 1080p). • Trailer - original trailer for Brief Encounter. In English, not subtitled. (4 min, 1080i).